Afro Chic sits on Diani Beach, in a beautifully landscaped garden on the shores of Kenya's Indian Ocean. The gardens have a lovely pool with jacuzzi and 9 of the 10 rooms have balconies with views to the ocean, the 10th room 'queen of sheba' has views of the gardens and fish pond. All of the bathrooms have large showers and two rooms also have bath tubs. Activities on offer include diving and snorkelling, wind surfing, kite surfing, jet skis, dolphin boat trips, magrove bird watching, deep sea fishing, island excursions, trips to Shimba Hills and Mwalugunje Elephant Sanctuary. Tennis, squash, gym and spa activities can be booked at neighbouring properties. Dining here is a sumptuous affair with experienced chefs providing a mix of culinary styles including Indian, Swahili, Mediterranean and Italian. Guests can choose to eat what they want, when they want, where they want, dining is very flexible! Open: Afro Chic is open all year. 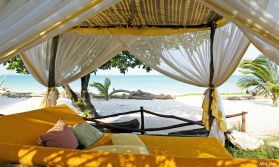 Location: Afro Chic is on Diani Beach, 1 hours’ drive south of Mombasa. Alternatively, Ukunda airstrip is just a 12 minute drive from the hotel. Rooms: There are 10 guest rooms, all en-suite, and with private balconies with sun loungers for secluded relaxation. Rooms are equipped with telephone, TV and DVD player, iPod dock, minibar, tea and coffee station and digital safe. There are 4 categories of room: garden view deluxe room, ocean view deluxe room, junior suite and executive suite. Activities: You may not wish to do more than sunbathe on the beach, stroll through the grounds and take a dip in the pool, but there are other options should you want them. Staff can arrange water-based activities including diving – PADI courses can be done here - and snorkelling, jet skiing, windsurfing, kite surfing, kayaking, body boarding, deep sea fishing and cruises to watch dolphins. On land there is a golf course nearby and various excursions can be organised including visits to local craft markets, Shimba Hills Reserve and Mwaluganje Elephant Sanctuary. The hotel has a spa where you can enjoy a range of health and beauty treatments and there is a gym in the vicinity which guests are welcome to use. Facilities: Afro Chic has indoor and outdoor lounges, a bar and a choice of dining areas including by the pool, on the sunny terrace and in the gardens. There is an attractive swimming pool and a Jacuzzi. Guest are welcome to browse through and borrow their choice from the selection of books and DVDs, and there is free Wi-Fi. The hotel offers a laundry service. Dining: Meals are served at individual tables, indoors or outdoors as you prefer. Private dining on your own terrace can be arranged. Children: Children of all ages are welcome, although there are no specific facilities for children. Babysitting can be arranged. Communication: There is free Wi-Fi internet access in public areas. Notes: The hotel accepts major credit cards. "Superlative. Nothing negative to say. Superb facilities and service as you would expect from such an upmarket establishment. " "Afro Chic is possibly the best hotel I have ever stayed in. Richard Johnson and his team have a real ethos of personal but unobtrusive service which just doesn't exist any more in Europe. As well as Richard, I'd particularly like to mention Donald and Fiah who really brightened my stay by talking at length about ordinary life in the Diani area. The food, setting and service are amazing and I have never enjoyed a hotel stay so much. The only slight issue is that you are certain to be surrounded by beach boys trying to sell you stuff as soon as you step of the hotel grounds on to the beach, but this is not a problem as long as you're firm with them, and is something you are likely to experience anywhere in this area. When my transfer to the next hotel didn't turn up, Richard personally drove me over to Msambweni - how's that for service!?"